There are hundreds of historic houses in Sandwich. The Historical Commission is currently working on updating histories of these homes for the Massachusetts Cultural Resource Information System (MACRIS). Many of these histories haven’t been updated since the 1970s. 1. Take a look at a few of the house histories we’ve updated. This will give you an idea of what MACRIS “Form B” is all about. 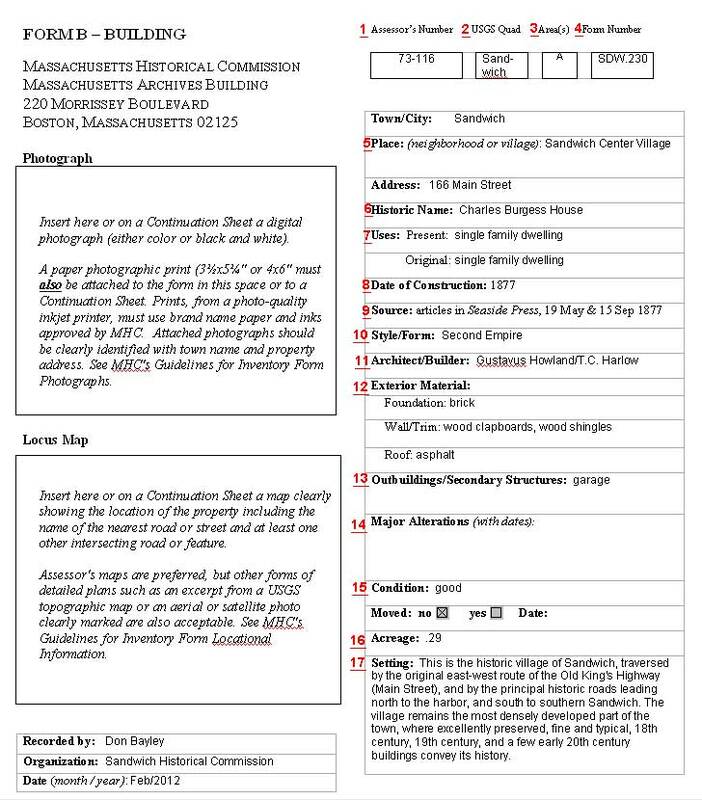 The Massachusetts Historic Commission (MHC) hosts a database known as the Massachusetts Cultural Resource Information System (MACRIS). View this short video (produced by the West Tisbury Historical Commission) to learn how to access MACRIS. Go to the Sandwich database on MACRIS and find the Form B for your house. 3. Visit the Town Assessor’s mapping website. You will be using this site to obtain information for MACRIS Form B (parcel IDs, land area, year built and maps). –click Property Search, a map will appear with property outlined in red and on the right you will see Parcel ID Number (ie. 82-014) and Land Area (ie. 1.02 acre). Also note Year Built and Design. These will be helpful when completing the MACRIS Form B for your house. 4. Visit the Sandwich Town Archives. They are in the McKnight Room in the back of the Library and open Tuesday, Wednesday and Thursday from 9:30 to 12: 30, and 1:30 to 4:30.
a) Historical Commission Asset Files: This is a good place to start your house history search. There is a folder for each house containing information that has been collected over the years. Ask us or Archivist Barbara Gill for the Historical Commission’s Asset Number for your house. There is also a zoning map in the Archives where you can look up your property and get the Asset Number. The actual folders are in file cabinets along the back (west) wall in numerical order. d) “Manuscript Collection:” These are in folders in two 3-drawer file cabinets. Here you will find pamphlets, reports, and newspaper clippings organized by Subject, Institutions and Families. In the Family files are deeds, correspondence and other documents which date from the 17th through 19th centuries. e) Tax Records of the Office of the Assessor: 1783-1860 and 1903-1945 (incomplete). These can often be a great help in researching who owned a home and when. But, as noted, these are incomplete. Items: 1783 – 1860 are located along west wall; 1903 – 1945 are in Library storage downstairs. j) Books: There are several copies of local historian Russell Lovell’s book, Sandwich, A Cape Cod Town in the Archives. This is a great resource. You may find additional information about the early inhabitants of your home here as well as bits of history that may have taken place in your neighborhood, even on your street. Barlow, Raymond E. & Kaiser, Joan E., The Glass Industry in Sandwich, Vol. 1-5. Windham, NH: Kaiser Publishing Company, Inc., 1989-1993. Cullity, Rosanna & Cullity, John Nye, A Sandwich Album, Sandwich, MA: The Nye Family of America Association, Inc., 1987. Lovell, R. A. Jr., Sandwich, A Cape Cod Town. Taunton, MA: Town of Sandwich Massachusetts Archives and Historical Center, 1996. Vuilleumier, Marion R., Scenes of America Sandwich Cape Cod’s Oldest Town. Portsmouth, NH: Arcadia Publishing, 2006. Access: by permission of church staff, 508-888-0434. Calvinistic Congregational Society, the Pilgrim Church, the Sandwich Federated Church, the Methodist Episcopal Church, the Congregational Church, the Unitarian Congregation, First Parish Church, and the First Church of Christ. Historical records, 1845- date. Access: by permission of the parish staff, 508-888-0209. Historical records, 1854-1968. Access: by permission of church staff, 508-888-2828. Annual meeting records, and records of membership, marriage, baptisms and deaths. Also includes correspondence, receipts and deeds pertaining to the building and its construction in 1899. Ask us for a Form B Template for your Area. Page 1 of the form looks like this. Scroll down and follow the red numbers step-by-step. There are PDF files online for each area. Become familiar with these, They will tell you which area your house is in and also provide information for Page 2 of Form B. Select Sandwich and Add to List, click Next. Select Area and Add to List, click Next. You will now have links to all the Area PDf files. You may want to download the ones for your area(s) to your PC. 6. Historic Name: Usually you can obtain this from the old MACRIS for your house. Go to the MACRIS website, http://mhc-macris.net/towns.aspx Select Sandwich, Add to List, click Next. Type in your street name (ie. Main St) then click Next. You will get a list of all the houses on your street with Historic Property Names for those built prior to 1900. To view the Form B for your house just click the pdf link. 7. Uses: Usually you can obtain this from the Assessors website and/or the old MACRIS Form B for your home. 8, 9, 10, 11, 12, 13, 14, 15: Start with the info from the old MACRIS Form B for your house and update, if need be, as you do your research. 17. 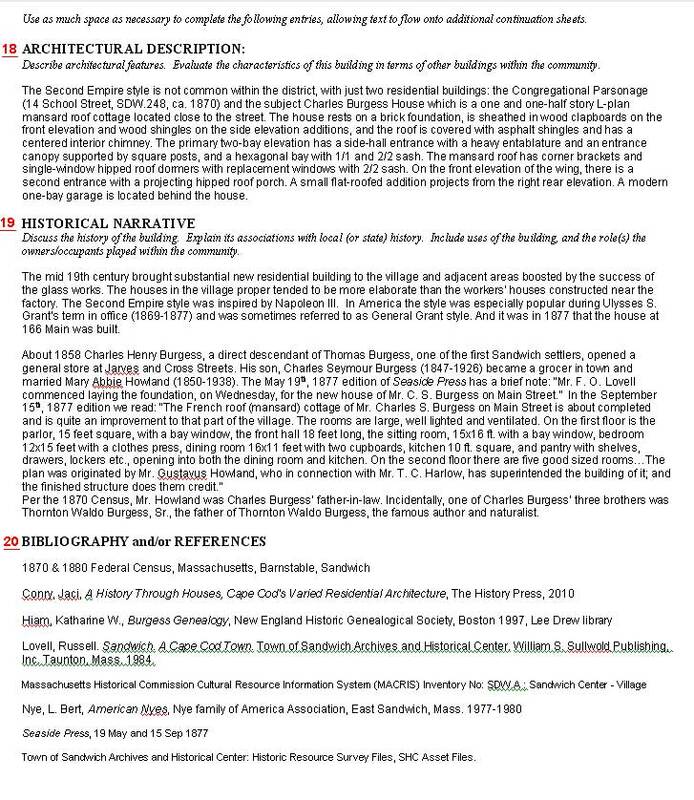 Setting: This can be found in the Area pdf files (see #3 above). 18: This can be usually found in the Area pdf files (see #3 above). 19, 20: Start with the old Form B for your house then add, correct and compile using the results of your research in the Archives and/or online. Parcel Number (ie. 82-014) and Land Area (ie. 1.02 acre). Also note Year Built and Design. (These will be helpful when completing the MACRIS forms).